Bogueva, Diana and Marinova, Dora 2018. Handbook of Research on Social Marketing and Its Influence on Animal Origin Food Product Consumption. p. 148. Króliczewska, Bożena Miśta, Dorota Korzeniowska, Małgorzata Pecka-Kiełb, Ewa and Zachwieja, Andrzej 2018. Comparative evaluation of the quality and fatty acid profile of meat from brown hares and domestic rabbits offered the same diet. Meat Science, Vol. 145, Issue. , p. 292. Kjellstrom, Tord Friel, Sharon Dixon, Jane Corvalan, Carlos Rehfuess, Eva Campbell-Lendrum, Diarmid Gore, Fiona and Bartram, Jamie 2007. Urban Environmental Health Hazards and Health Equity. Journal of Urban Health, Vol. 84, Issue. S1, p. 86. Dixon, Jane M. and Capon, Anthony G. 2007. Healthy, just and eco-sensitive cities: moving forward. New South Wales Public Health Bulletin, Vol. 18, Issue. 12, p. 209. National Centre for Epidemiology and Population Health, The Australian National University, Canberra, Australia. 1Popkin, B. The nutrition transition in the developing world. Development Policy Review. 2003; 21: 581–97. 2Walker, P, Rhubart-Berg, P, McKenzie, S, Kelling, K, Lawrence, RS. 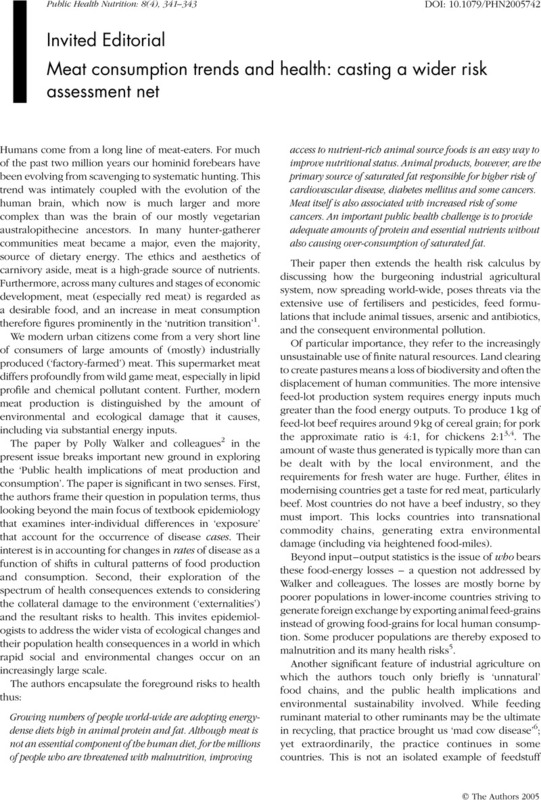 Public health implications of meat production and consumption. Public Health Nutrition. 2005; 8(4): 348–56. 3McMichael, AJ. Planetary Overload: Global Environmental Change and the Health of the Human Species. Cambridge: Cambridge University Press, 1993. 4Tilman, D, Cassman, K, Matson, P, Naylor, R, Polasky, S. Agricultural sustainability and intensive production practices. Nature. 2002; 418: 671–7. 5Lang, T, Heasman, M. Food Wars. The Battle for Mouths, Minds and Markets. London: Earthscan, 2004. 6McMichael, AJ. Bovine spongiform encephalopathy: its wider meaning for population health. British Medical Journal. 1996; 312: 1313–4. 7Bambrick, H, Kjellstrom, T. Good for your heart but bad for your baby? Revised guidelines for fish consumption in pregnancy. Medical Journal of Australia. 2004; 161: 61–2. 8Collignon, PJ. Vancomycin-resistant enterococci and use of avoparcin in animal feed: is there a link?. Medical Journal of Australia. 1999; 171: 144–6. 9JETACAR. The Use of Antibiotics in Food-Producing Animals: Antibiotic Resistant Bacteria in Animals and Humans. Report of the Joint Expert Advisory Committee on Antibiotic Resistance (JETACAR). Canberra: Department of Health and Aged Care, 1999. 10Brown, L. Learning from China: Why the Western Economic Model will not Work for the World [online], 2005. Available at www.earth-policy.org/Updates/2005/Update46.htm. 11McMichael, AJ. Human Frontiers, Environments and Disease: Past Patterns, Uncertain Futures. Cambridge: Cambridge University Press, 2001. 12 British Nutrition Foundation. n-3 Fatty Acids and Health. London: British Nutrition Foundation, 1999. 13Schmidt, EB, Skou, HA, Christensen, JH, Dyerberg, J. n – 3 Fatty acids from fish and coronary artery disease: implications for public health. Public Health Nutrition. 2000; 3: 91–8. 14Weiss, RA, McMichael, AJ. Social and environmental risk factors in the emergence of infectious diseases. Nature Medicine. 2004; 10(Suppl. 12) S70–6. 15Intergovermental Panel on Climate Change. Climate Change 2001: The Scientific Basis. Contribution of Working Group 1 to the Third Assessment Report. New York: Cambridge University Press, 2001. 16McMichael, AJ, Campbell-Lendrum, DH, Kovats, S, Edwards, S, Wilkinson, P, Wilson, T, et al. Climate change. In: Ezzati, M, Lopez, A, Rodgers, A, Mathers, C, eds. Comparative Quantification of Health Risks: Global and Regional Burden of Disease due to Selected Major Risk Factors. Geneva: World Health Organization, 2004, 1543–649. 17Haines, A, Patz, JA. Health effects of climate change. Journal of the American Medical Association. 2004; 291: 99–103.